Last weekend, we headed up to Creede, Colorado, on the shores of the Rio Grande. The reason for our trip was to visit friends and to see a few plays at the Creede Repertory Theatre, but my thoughts were of course "there's got to be some good fishing in that corner of Colorado". Sure enough, the best wife ever has planned for me to go out for a day with a friend of her's. Since I picked up Tenkara, I started focusing more on native species, such as Greenback Cutthroat native to the South Platte and Arkansas drainage and which is now found only in some high country lakes and creeks, namely in Rocky Mountain National Park. While in Creede, I thought I should give it a shot at getting into some Rio Grande Cutthroats, one of the other four cutthroat subspecies native to Colorado (the other two, next to Greenback Cutthroats are Colorado River Cutthroat and the now extinct Yellowfin Cutthroat). I did a lot of research to find some of the creeks where there are still some populations of Rio Grande Cutthorat and found some that are fairly close to Creede, but unfortunately the trip was too short to allow for me to do a full day hike into the back country that would have been required. But I do know where they are and I should pay them a visit on my next trip to Creede, probably next year. That being said, I obviously did not catch any Rio Grande Cutthroats, but I got the opportunity to fish with a friend of my wife who grew up in Creede and knows the area very well. She originally planned to take me to a creek maybe 20 miles outside of Creede, but the day before our outing, my wife and I explored the area around Creede and we drove be a creek that I started salivating over while driving by it. Alas, as for much of the water in the region and the Rio Grande itself, it was on private property. As much as I have an issue with rivers and creeks are not available to the public, I myself would probably not want just anybody wander on my property and fish a river that would run through it. It starts with liability issues to trash and going as far as plainly "this is my land". ﻿Anyway, I mentioned this creek to our friend that was about to take me out the next day and she simply said "I don't think that my dad would have a problem us fishing there if you want". What? Really? I am that lucky that my friend's dad owns the ranch where that particular stretch of creek is running through? Turns out I was. You should have seen my big grin and excitement. The next morning, after a hearty breakfast in Creede, we hit the road and got to said creek mid-morning. I immediately regretted to bring the ITO and the 12ft Iwana, realizing that those rods are too much for this overgrown little creek. My fishing partner, Adrian, fished with the Fountainhead Caddis 330 which is my loaner rod and which happened to be the best suited rod of the three I brought. I actually wished I would have had the Tenkara Fishing 300 rod which would have been the perfect rod for this creek. Unfortunately, I left this rod behind with TenkaraBum for his review and testing when I was in NYC the weekend before. I gave Adrian the quick and dirty introduction to Tenkara (is there actually any other way?) and 5 minutes later she was into her first trout. To quote her "... this is so easy!" 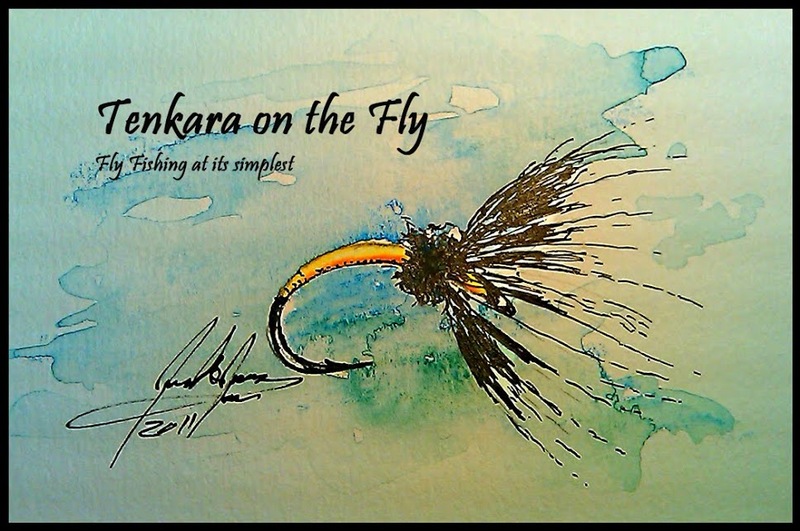 and yes, we do have another Tenkara convert! We were fishing for maybe 90 minutes, taking turns on the creeks pools, both of us hooking with trout in almost every spot that looked like it could hold a fish. Adrian - my host and newst Tenkara convert! ﻿Then Adrian had to leave to get some work done, leaving me with this creek full of trout just for myself. I immediately switched from my 12ft Iwana to the Caddis 330. The Caddis 330 was rigged with the Tenkara USA 10.5ft furled line and I just couldn't get comfortable with how it cast, so I switched to a level line which performed much more to my liking on this 5:5 action rod. It appears that my dislike for level lines only applies to the stiffer 6:4 rods like the 12ft Iwana or Amago, but on the softer rods like the Caddis 330 or Tenkara Fishing 300 I definitively prefer the level lines. Anyhow, the day brought some of the best fishing I have ever encountered - fish number wise -; I hooked and landed well over 50 trout with a guess that the final number was somewhere close to 100. I was literally hooking fish on every other or third cast. I would never have thought that I would say this, but at some point it got really annoying if one of the small brookies instead one of the resident brown trout would hit the fly. This was the 3rd outing with my new Ti Net of TrailLite Designs and I have to say that I continue to be very impressed by the quality and extreme lightness of the net. I took several rough tumbles (yes, I am clumsy) and there is not a scratch on it. Speaking of brown trout, from the pictures it looks like a good fish in this creek would be 10" and the brown trout were around that size, but there was one spot, oh boy, where the creek was tumbling down into a small pool and hitting a big rock, where a huge brown trout, that I would guess to have been at least 18", took my CDC & Elk on the downstream presentation. I had this fish on for exactly 2 seconds but those were the best 2 seconds of the entire day. I was shaking after it got off. I fished my way upstream until I hit some beaver ponds with smallish but eager brookies that would hit anything that looks remotely like a fly. By that time it was already late afternoon and I decided to pack-up and head back to Creede to meet-up with my wife and daughter. At the end of the day, I felt very satisfied how things went and I will make sure to talk myself into revisiting this little creek maybe sometime next year. PS: Those were my favorite fish... the markings couldn't get any more different!